How much does it cost to travel to Barcelona? How much money will you need in Barcelona? €116 ($131) is the average daily price for traveling in Barcelona. The average price of food for one day is €23 ($26). The average price of a hotel for a couple is €149 ($167). Additional pricing is in the table below. These average travel prices have been collected from other travelers to help you plan your own travel budget. How much money do I need for Barcelona? 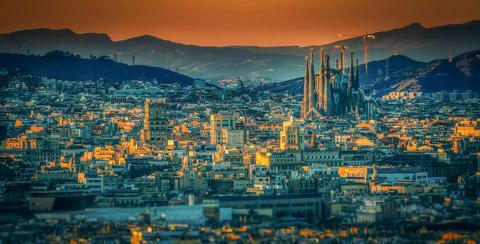 Barcelona is the second largest city in Spain with a population of over 1.5 million people. It's also the capital of Catalonia and is located on the northeastern part of the Mediterranean coast. Barcelona is one of the country's most popular travel destinations because of its rich history, interesting architecture, and vibrant culture. Barcelona hosted the 1992 Summer Olympic games and that had a strong influence over tourism in the area. Many different neighborhoods were renovated and rebuilt. Modern design became the norm in many parts of the city, although there is still an old city feel and many efforts at preservation. Barcelona is a wonderful travel destination year around. There are many outdoor markets, restaurants, cafes and events that take advantage of the relatively mild weather. Although the summer months are the peak time for visitors, it's great to go during the low season winter months as well. The weather is not that cold, averaging about 10 degrees Celsius with high humidity and rain is uncommon. In general, the best time to visit is between April and June and late September and November. Part of the pleasure of Barcelona is simply exploring the city, wandering through its streets, finding the many hidden squares, and soaking up the great atmosphere. This is particularly enjoyable in the Barri Gotic. There are many major attractions around the city. The Temple of Augustus is impressive and is found inside a building that now has four columns and Corinthian fluted shafts, and a architrave of the podium. The Temple was built by the Romans during the Imperial period in the colony of Barcino (which is now Barcelona). It was a place of worship for Emperor Augustus. Many people enjoy seeing the Gaudi architecture that is throughout the city. Some good examples include the Parc Guell in Gracia, the Sagarad Familia in Eixample, and the houses La Pedrera/Casa Mila and La Casa Batllo in Eixample. To see the best Modernisme, or art nouveau buildings around town, take the Ruta del Modernisme, which is run by Modernisme Centre. If you don't want to pay for the trip, you can walk the main route in a few hours. The most famous building in the city is La Sagrada Familia. The church is still incomplete and has been declared a UNESCO World Heritage Site. It's impressive height and details make it a breathtaking place to visit. The building began about a century ago and is still in progress. At the center of the city you will find Barcelona's Old Town, Ciutat Vella. There are many sights concentrated in this area including Barri Gotic, La Rambla, El Raval, and El Born. Next to Ciutat Villa, is Eixample, which is the Modernist quarter. This area is famous for its nouveau buildings. Further out is Gracia, which was originally its own town, but later joined into Barcelona. It has narrow streets with a cosmopolitan atmosphere. If you're looking to get away from the tourists then this area offers a young and hip atmosphere. Sants-Montjuic is where you will find Placa d'Espanya, or Spain Square. This square often hosts many different fairs or exhibitions. There are also many museums, monuments and festivals that appeal to tourists. Other neighborhoods include Sant Marti and the Inland Suburbs. There are many yearly festivals in Barcelona, many of which highlight the Catalonia culture. Cavalcada de Reis is a float parade held in January. Sonar is a three day music festival in June. Festes de Gracia is a Catalonian celebration in August. There's a midsummer solstice celebration in June known as Revetlla de Sant Joan. La Merce is the annual festival of the City of Barcelona that is held in September. There are many others as well, so check a detailed calender before your trip begins. Food in Barcelona can vary by restaurant and even neighborhood. As with most cities, avoid eating near major tourist attractions as the food will be more expensive and lower in quality. Many restaurants in Barcelona offer set menus (menu del dia). This menu of the day is usually a two course meal with a salad and main dish. Occasionally a drink and dessert may also be included. There are usually three or four simple options and the price is reasonable, from 10-20 euros depending on the restaurant. The portion sizes may be small though. Also be on the lookout for lunch specials which may be available on weekdays between 2pm and 4pm. This usually offers a significant discount. If you're on a particularly tight budget, there are many different supermarkets around town that offer prepared food. This is a great way to enjoy a picnic and some decent food, without paying high restaurant prices. Public transportation in Barcelona is good. The Barcelona Bus Turistic provides three routes that connect the city's main tourist sites. There's a northbound and southbound line that leaves from opposite sides of the Placa de Catalunya. The buses are done in a hop-on/hop-off format so that you can see as many attractions as you want without paying an additional cost. Buses are double decker with good views and information provided by earphones. The metro is a great way to get around the city. Trains are fast and frequent and it is relatively easy to navigate the system. Ticketing machines usually offer an English option as well. Do note, that there are really two metro systems, one operated by TMB and one operated by FGC. If you are changing between systems you will have to leave the station and enter a new paygate. Single journey tickets will have to be repurchased. Looking for a party in Madrid? Use the Bus Turístic to get around town for 25 euros for a get a great overview of the city on this fun double decker bus. There are also multi-day passes available which is a much better deal. It's a hop-on hop-off system where you can see various sites around Barcelona and then get back on to see something else or return to your hotel. One of the main stops is at the Placa de Catalunya. The buses also offer earphones with descriptions of different destinations in a variety of languages.